Within the last year or so, my son discovered Star Wars. He quickly became a big fan. 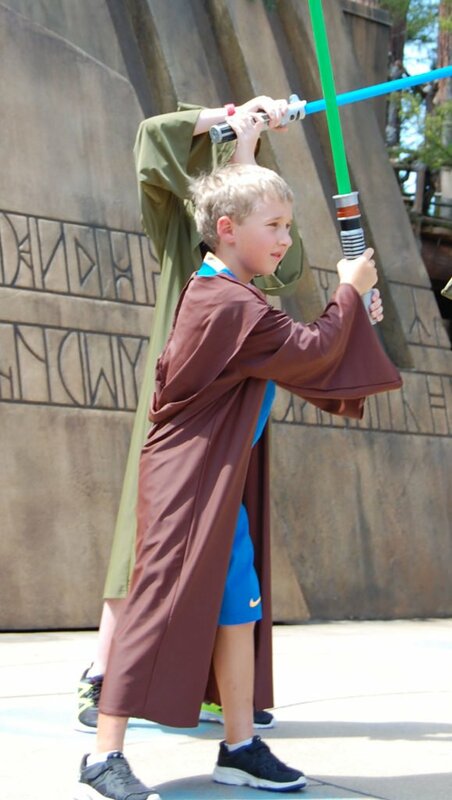 So, he was very excited to take part in Jedi Training when we visited Disney World this summer. It was a great experience. 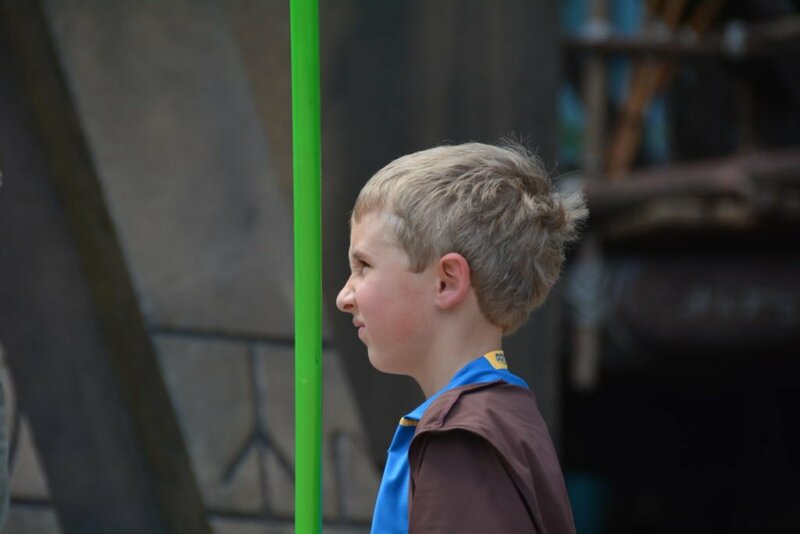 If you are considering letting your little ones battle the Dark Side, here is everything you need to know about Jedi Training: Trials of the Temple. 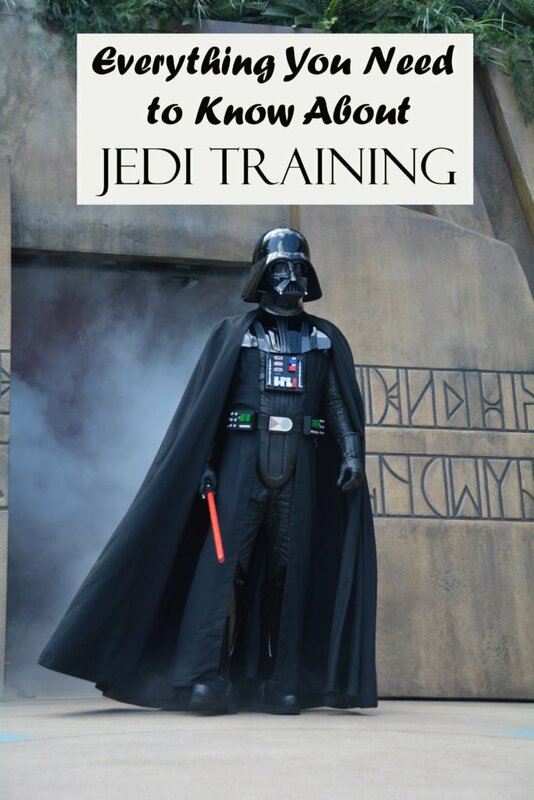 Jedi Training is available for children ages 4-12. Only a limited number of children each day can participate in Jedi Training, so you must sign up for it at the beginning of the day. There are approximately 15 shows per day with 20-30 slots available in each show. The slots are assigned on a first come, first serve basis. In order to ensure that your child gets a slot, I would recommend that you get to Hollywood Studios at park opening and go straight to sign-ups. You will find the sign-up station at the Indiana Jones Adventure Outpost, near the Indiana Jones Stunt Show. If you are there as the park opens, you can follow the crowd to the left of the park. There will be others heading that way, plus there will be cast members and signs directing you. You will need your child to be present with you when you sign-up. When it’s your turn, you will be asked which of the remaining shows you want to be a part of. The cast member will then ask your child a few questions, such as their age, if they agree to follow the rules, and if they are ready to join the rebellion. You will then be given a time to return for your show. You will need to return 30 minutes before your show. The shows are between 20-25 minutes long, so you can expect to devote an hour to this. You will return to the Adventure Outpost at the appropriate time. When you return for your show, the cast members will group the children together so they can make sure everyone is there. They will instruct the kids on what they will be doing and will give them their robes. They also split the kids into two groups. When we did this, it was in the heat of summer and was very hot. The cast members gave each kid water to drink and were very good about encouraging the kids to drink plenty of it before the show started. While the young Jedi’s are getting their instructions, a Photopass photographer meets with the parents. There are two Photopass photographers that take pictures during the show. They will give each family a Photopass card that contains all of the photos from the show. The photographer who meets with the parents explains how the show will go and where to stand when the show begins. One very good tip that the photographer gave to us is to pay attention to the shoes your child is wearing that day. When you have 30 kids on a stage together all dressed in similar robes, it is difficult to pick your kid out. Looking at their shoes is sometimes the only way to know which one is yours. When it is time for the show to begin, a cast member will lead all of the kids in a mini parade the short distance to the stage, which is just to the side of Star Tours. The parents are instructed to walk alongside their child. The cast member leading the way clears the way through the crowd while announcing the approach of the next class of Jedi’s. Once at the stage, each child is given a light saber. Each group is set up on a different part of the stage. The Jedi Master and his two assistants then lead the kids through a light saber routine. After a few minutes to perfect the routine, a door opens. Darth Vader and Seventh Sister come out. One group of kids take on Darth Vader while the other group takes on Seventh Sister. 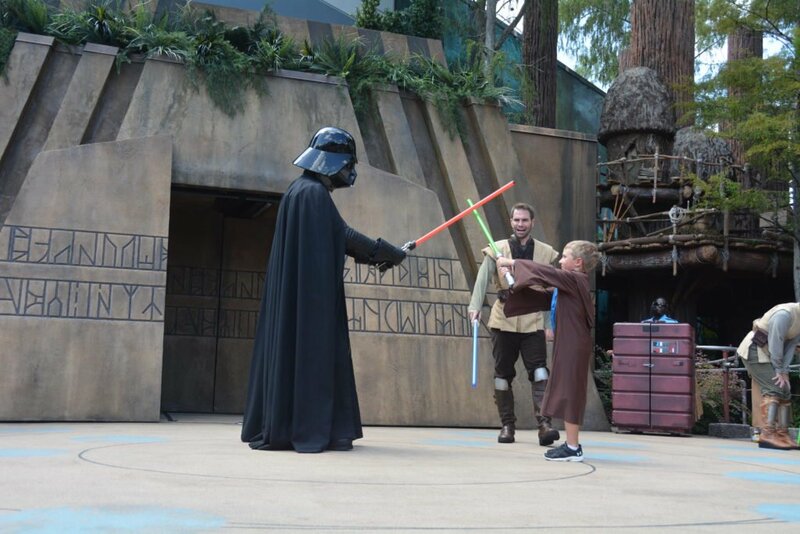 Each child gets a chance to show off their light saber skills one-on-one against one of the villains. At the end of the show, each young Jedi poses for a final picture before leaving the stage. The parents are able to collect their children as they come off of the stage. As each kid leaves the stage, they are given a pin for their participation. As recommended to me by the Photopass photographer, after the show was over, I stopped by one of the photo centers. There is one in each of the four parks, as well as one in Disney Springs. You can go to any of them. I had the cast member there to pull the pictures of Boston off of the Photopass card I had been given at Jedi Training and transfer them to my Memory Maker account. This took only about 5 minutes. It probably would have taken me much longer to do this myself, so I’m glad I had them to do it. Prior to our trip, Boston was excited about doing Jedi Training. He loved doing it. For days afterwards, he talked about the show. He really got into it and felt that he was seriously using the force against the Dark Side. It was fun for us to watch him participate in the show. I’m so glad we took the time to do this. A couple of friends have let their children do Jedi Training too. They all had enjoyed it too. If you or your child is a Star Wars fan, this is definitely a must-do. I hope you have as much fun with it as we did. 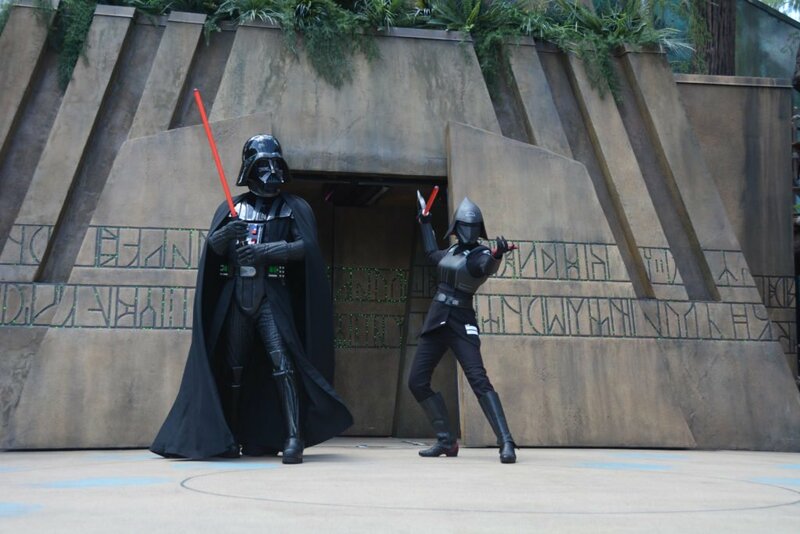 For more Star Wars things to do in the parks, check out my 10 Magical Must-Do’s for Star Wars Fans. 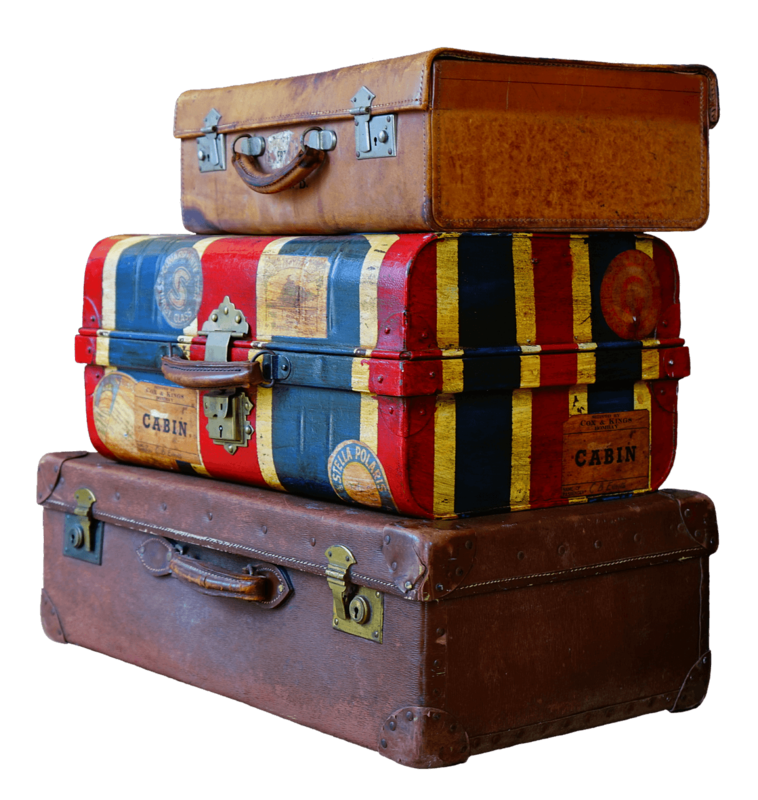 Happy travels and have a magical day!